When you have acne-prone skin, trying to find makeup products that don’t make you break out is tricky. Does a product need to say it’s “non-comedogenic”? Are there certain ingredients to avoid? We address these concerns and more, plus provide our expert makeup recommendations. There are a variety of factors you must consider when you’re dealing with acne, but makeup, in and of itself, is not to blame. Of course, if you aren’t removing ALL your makeup every night, especially if you wear heavy makeup, that’s another story—you most likely will see more clogged pores and breakouts the next morning. Using a soft washcloth with your cleanser or a very soft cleansing brush can make all the difference in the world. It’s also possible that certain types of makeup can worsen breakouts. Interestingly, the types of ingredients and formulas you want to avoid aren’t necessarily what you would expect—we’re about to bust one of the biggest myths in the cosmetics industry and help you make sense of it all! You’ve no doubt seen the phrase “non-comedogenic”—you may even look for it when shopping for makeup, hoping such products won’t clog pores or contribute to acne. Unfortunately, you can’t trust the non-comedogenic (or the less common “non-acnegenic”) claims because there are no approved or regulated standards for these statements anywhere in the world. With no guidelines or standards in place, even the thickest, greasiest, creamiest foundation can claim it “won’t clog pores”! As a general rule, the thicker the product, the more likely it is to be pore-clogging. And, be wary of the claim “oil-free.” Lots of ingredients can make skin feel or look greasy, but the ingredient list doesn’t always list traditional oils, so that could be misleading. Plus, oils aren’t a major cause of breakouts. In other words, we’re sad to say, buying only oil-free products is not a slam-dunk solution for acne-prone skin. Here’s what you really need to know when shopping for makeup for acne-prone skin. Don’t use alcohol-based (listed as SD or denatured alcohol) or fragrance-loaded makeup. This is sage advice for all skin types, but it’s especially true for those with oily, acne-prone skin because these types of ingredients can trigger a reaction that exacerbates breakouts and oiliness. Suffice it to say, it’s really, really important to avoid such products. Avoid thick or solid makeup products like stick or creamy compact foundations. The types of ingredients that keep these products in solid or semi-solid form are iffy for those with breakout-prone skin. We understand the temptation to use solid foundations and stick concealers if you’re trying to conceal breakouts and red areas—they often offer the high-powered coverage you want—but, fortunately, there are plenty of alternatives. We share our favorites below. A flawless complexion starts with sun protection, and we know what it’s like trying to find the right SPF product when you’re afraid it will make you break out. Our RESIST Smoothing Primer Serum SPF 30 is an excellent option for acne-prone skin. With a clear, lightweight base that enhances smooth makeup application, this primer also provides sun protection and antioxidants—you get better-looking makeup and better-looking skin in one easy product! Foundation and concealer are the other most difficult makeup items to find for acne-prone skin. 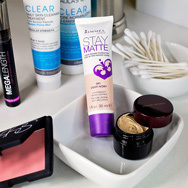 In general, matte-finish liquid formulas tend to last longer than creamier formulas and are ideal over breakouts and oily skin. Our RESIST Anti-Aging Serum Foundation – Matte is ideal for acne-prone skin. It provides buildable coverage and skin-loving ingredients. More to love, the matte finish holds back unwanted shine for a worry-free complexion all day long. Finish with our RESIST Flawless Finish Pressed Powder to softly set makeup, while adding a hint of natural color to refine skin. What about blush and bronzer? Generally speaking, powder blushes and bronzers are the best option for acne-prone skin. Gels or liquids tend to “grab” over areas of uneven skin texture or pool in enlarged pores, and creamy formulas can be too emollient, leading to clogged pores. Before we end, it’s incredibly important to mention that using the right skincare routine for acne is critical. A gentle cleanser, a salicylic acid–based exfoliant, and an anti-acne product containing benzoyl peroxide are key to combating acne. See our article on How to Prevent Acne for more tips.